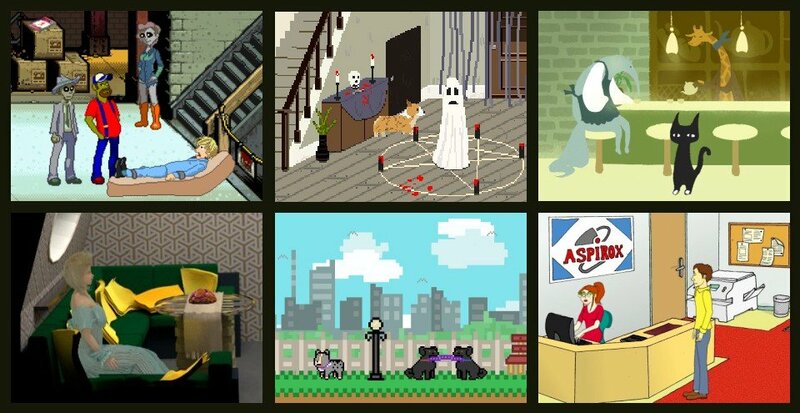 This month you can investigate a gruesome murder, a mystery in an abandoned village, or the theft of a brain from a zombie farm. 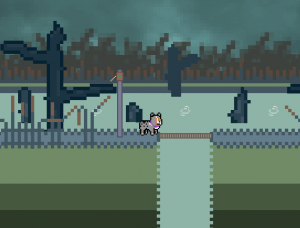 You could also adventure as three dogs trapped in a strange world, or a single cat trapped in a time-loop. Perhaps you’d rather face up to your fears of a fearsome goose, or find out what can go wrong when you don't listen to your mother. Alternatively, you can head back to the 1970s to create a different ending to an episode of a classic science fiction series. All these await in this month's roundup of releases from the freeware scene. For canine friends Sydney, Frank and Holmes, it started as just another day in the local dog park. But Holmes' powerful nose picked up something strange at the edge of the park, and the trio went to investigate. Now they find themselves trapped in a bizarre alternate world, and they aren't the first dogs to end up stuck there. Some of the previous victims have fallen to despair, giving up hope of rescue. If they are going to get to the bottom of this mystery and find a way to return home, the three friends are going to have to make full use of all their talents. Wicked Hardcorg and ChevronElephant have created a fantasy canine adventure in Three Dog Night. The graphics have a retro pixel look, which is especially pronounced in the backgrounds, as the scenery often seems to be made up of large blocks. For the characters, smaller pixels have been used to present a wide variety of models, including squirrels and mice. The presentation is like a side-scrolling 2D platformer, though jumping skills are not required. When the characters are conversing, a still image of the speaking character appears. These use the same resolution as the in-game characters but, being much larger, show more detail. The music matches the appearance, with 8-bit tunes that would not be out of place in a classic console game, with synthesised notes and rustling percussion. It also has sound effects of a similar style. Control is handled using the keyboard, with arrow keys for movement. Each of the three friends has a unique ability. Sydney can jump, allowing him to reach higher platforms. Frank is a tiny Dachshund, and can slip through small spaces. Finally, Holmes’ powerful nose can find otherwise hidden items. The group is represented by whichever dog is currently active, with a tap of the Tab key cycling between them. The action takes place across several levels, each occurring in a different environment, including a swamp and a magical wood. The first three each predominantly make use of one character, with the closing levels using all available skills. However, there is more to the puzzles than just using the dogs’ abilities. You will also need to work out the age order of a family of squirrels, and solve some fiendish riddles. The game is written with gentle humour, with plenty of enjoyable dialogue between the pals and the others they meet. Three Dog Night can be downloaded from the RPG Maker website. After a visit to your parents, you decided to take a route home through the mountains instead of sticking to the main road. When a tire blows out, and you realise you didn't replace the spare, this starts to look like a very bad decision. With night having fallen, and the weather proving less than pleasant, it looks like you are in for an uncomfortable night. But then you spot a sign down the road, showing the way to a small village called Greenville. But this town is not what it once was, and its dark history may make you wish you'd stayed with your car. In Chahara, Claydo has made a highly effective psychological horror game. The graphics feature an overhead view, reminiscent of classic role-playing games, though with a much higher resolution. The protagonist is a small blue-haired young woman with minimal animation. With the game taking place at night, much of the screen is darkened, though not enough to make objects unrecognisable. The only light is a torch beam pointing straight in the direction the protagonist is facing, with a dimmer 90-degree fan of light around it. Walking through a forest brings you to the village, which is in a state of disrepair and has a very full graveyard. There is no music within the game itself, with sound solely consisting of ambient effects. The most notable of these is a recording of wind blowing through the trees, which adds greatly to the disturbing atmosphere. The arrow keys are used to navigate and the return key to interact with whatever hotspot you are facing. There are a lot of things to interact with, including cupboards, drawers and bookcases scattered around the buildings. You will want to be thorough in your exploration, as many of these contain vital items or clues to the village mysteries. I met no other characters in my travels, nor (though I have not yet reached the end), do there appear to be any monsters. Nevertheless, the lack of light and the constant sighing of the wind served to create a disturbing mood, leading me to expect something terrible to leap out at any moment. 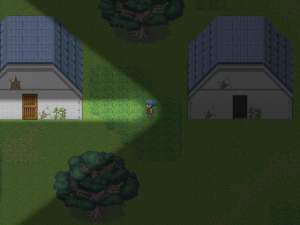 Chahara can be downloaded from the RPG Maker website. As an ace Viper pilot, Starbuck's skills are often called on by the commander of Battlestar Galactica. But is not just his superior who is impressed, as many ladies seem smitten by his charm as well. In a rare moment of downtime, Starbuck has booked a room on the luxurious Rising Star. He had originally planned to take the commander's daughter, Athena, but ended up taking Cassiopeia instead when Athena was busy. Little does he know that the commander has let his daughter out of her duties, and she is on her way to meet him even now. With two ladies expecting to have him all to themselves, he may soon wish he was out fighting Cylons instead. Based on the episode "The Long Patrol" from the original 1978 television series, Sandra Almeida gives players the chance to rewrite the script in Unexpected at the Rising Star. The game is presented in prerendered third-person, with 3D models that mirror the overall look of the original characters. These are also decently animated, including mouth animations for conversation, which includes close-up headshots of the speaker. Whilst part of a large fleet, you will only see a small part of the Rising Star, mostly two luxury guest rooms and the corridor connecting them. The game is fully vocalised, with each character having a unique voice. There are a variety of sound effects, including the swish of automatic doors and the clink of plates. Music fits the setting, with an easy listening piece in the Rising Star rooms to soothe visitors. 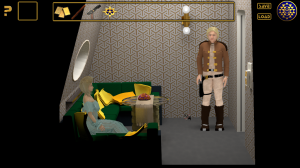 Control is point-and-click, with left-click moving the character around. Pointing at a hotspot causes a label to pop up, and right-clicking then opens up a verb coin. Except where inappropriate for a specific hotspot, this includes four options: Talk/Eat, Look, Interact and Shoot with Blaster. (This last action is an inadvisable choice in most situations.) The game has two modes. Original mode is simplified to work as a tutorial, and mostly follows the original script. Extended mode (activated by default) gives you more freedom, and also includes a separate scene where you play as a junior chef. You will need to deal with the snooty waiter, mix up a recipe from unclear instructions, and deal with a variety of malfunctioning machinery. There are multiple endings, the best one being where you outdo the original Starbuck and leave both women none the wiser. Unexpected at the Rising Star can be downloaded from the AGS website. In a world of anthropomorphic animals, a young cat wakes on the last day of school before the holidays. But the monkey headmaster has other ideas about how the future should go. Making use of a magical music box, he has found a way to make time loop so school will never actually come to an end. As he experiences the same day over and over again, our hero realises that no-one else seems able to fix the problem. With only a single repeated day in which to take the necessary actions, this will prove a challenge. Cocoa Moss has created a gentle but satisfying challenge with The Music Box. The graphics are done in an artistic cartoon style, with the protagonist shown as an upright solid-black cat with two large white eyes. 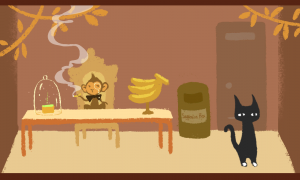 The other characters represent a wide variety of animals, including an anteater janitor and a giraffe running a cafe. The backgrounds are simply designed, with layered objects giving the impression of a 3D environment though movement is entirely 2D. The animation is basic as well, but this fits the graphical style. Environmental sounds include the beeping of an alarm clock at the start of the day and birds singing in the trees. Each location also has its own music, with soft piano and panpipe pieces providing a pleasant atmosphere. Arrow keys are used to move left and right. When you are standing in front of something you can interact with, the object acquires a gentle glow to indicate that interaction is possible. The appropriate action is selected automatically, such as starting a conversation or picking up an item. The day is split into three parts: morning, afternoon and evening. You can visit any of the four locations in each of these time periods, though there is no need to return to your home. Whilst you can explore any area for as long as you like, leaving moves the clock forward to the next segment. At the end of the evening, you are treated to a small cut-scene showing the music box, before the day restarts. You will need to talk to everyone and scour the environment for useful items to succeed. The final solution requires you to visit the locations in a specific order, and undertake particular tasks at each. Each loop is quite short, so repeating the day when you get it wrong is not a burden. The Music Box can be played online at the developer's website.